There are cases you want to make and add new ringtones to iPhone: you are tired of the limited ringtones built in iPhone, there is no option to create AAC from latest iTunes update, you are impressed with a tone which you want to further customize and make it as your iPhone ringtone. This makes a lot more sense of going to App Store to download ringtone apps for iPhone. But you will be at a loss when facing with so many "best" iPhone ringtone applications, free or paid. There is where the post comes. 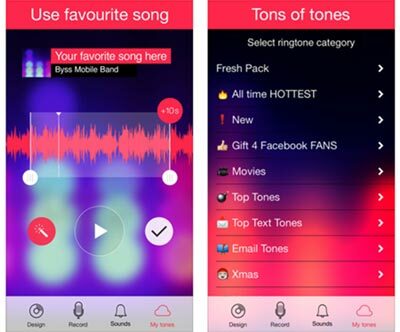 Our top 20 list of best ringtone apps for iPhone are shared, along with detailed guide to make ringtones for iPhone. MacX MediaTrans - Two-in-one iPhone ringtone maker and transfer tool that can create exclusive ringtone for iPhone and add ringtones, music, voice memos, photos, videos, etc to iPhone without iTunes. Most free iPhone ringtone apps get involved in ads or malware or fail to support the latest iPhone model which makes ringtone creation embarrassed. But our list is gathered and carefully selected based on the users rating, updating, cleanness and easy-to-use interface, so that you can not only create ringtones easily but with no bother of adware, but also download new ringtones to fix iPhone ringtone not working issue. Zentertain's Ringtone Maker joins in our best iPhone ringtone apps list because of the most straight forward and easy to use interface. Just choose any song on your iPhone, set the start spot, decide the length, make sure if you want fade in/out, and save the ringtone. With the free iPhone ringtone app, you can customize text tone, tweet tone, alert tone, mail tone, calendar tone and reminders tone. But the iPhone App doesn't support music transfer, which means you have to add ringtones to iPhone with iTunes or third-party data transfer tool. Some users suggest the music is silent and they cannot hear anythine on previews. 1. App is oudated and users complaint the iPhone 7 cannot make ringtones with the app. 2. No instructions or tutorial. 3. The ringtone length is limited to 30 seconds in free version. 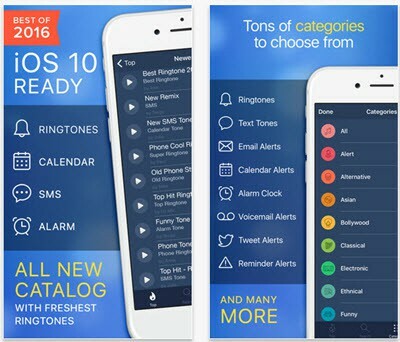 Ringtones for iPhone 2017 free is another great iOS 11 free app offering a large collection of the best ringtones for iPhone. Best of all, it's totally free app for iPhone, where you can find your favorite, high-quality and unique tones, send ringtone to iPhone, and even make ringtone for Whatapp. The latest version 4.0.1 works well on iOS 8.0 or higher version. Buy you have to bear in mind this free iPhone ringtone app offers adds that may disturb your ringtone enjoyment. 2. The file size is too large. You have to free up space on iPhone if your memory is barren before installation. 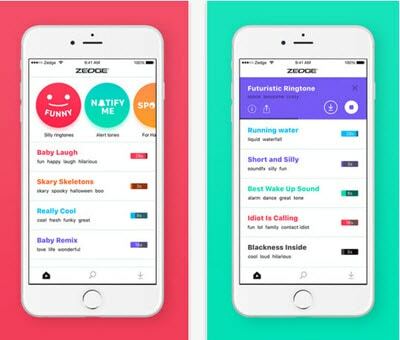 ZEDGE Ringtones is a highly acclaimed and most trusted free iPhone app in ringtone customization, as well as wallpapers, app icons, alarms, notification sounds, etc, upon log in. It's available for you to preview, download, customize and set free ringtones for iPhone within the app. If you want to find rock, rap & country and other music in any genres and customize any part of your iPhone, ZEDGE is one of the best ringtone apps for iPhone to download. While the app can be a little cluttered when it comes to the interface, which makes you a bit puzzled. Pros: Solid constructed with a lot of features. 1. Difficult to use interface. 2. Ringtones get erased after updating. You have to backup data before upgrade. 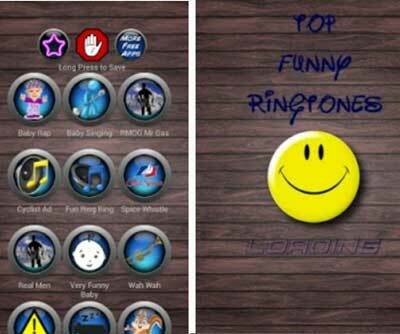 From such the iPhone ringtone app, you will download the most funny ringtones for iPhone in a way much easier than other free iPhone ringtone apps. 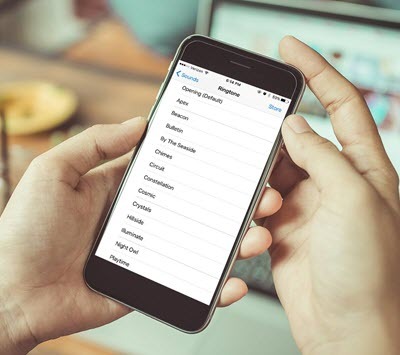 Besides the ability to customize free ringtones for iPhone, it also features the ability to touch up text tone, new voice mail alert, calendar alert, reminder alert and many more. Pros: Offer a lot of great tones and totally free. Cons: No custom in setting sound. TUUNESTM 2017 is one of the best ringtone apps for iPhone, which offers a lot of amazing ringtones created by top artists and ringtone producers, such as Taylor Swift, Justin Bieber, etc. You don't have to worry about the copyright issue. It's totally legal for you to set a magic call and message tone for your iPhone, discover your favorite music, set it as ringtone on iPhone instantly, without cables. It's available for free ringtone download. But the option is limited. The annoying thing is you have to watch ads in order to earn a certain among of coins so as to get free ringtones on iPhone. Pros: No subscription required and it's legal. 1. It is bundled with ads. 2. 2. Limited free tones in the free version. 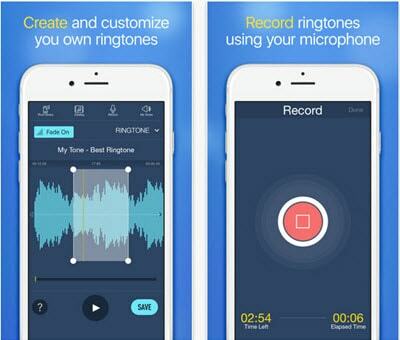 This is a fantastic free app for iPhone ringtones. With no need to pay for any ringtone, you can freely create unlimited ringtones, text tones, and alerts with any songs in your iPhone music library. However, you need to drag the song onto your iPhone and get it into the Settings to make it as your ringtone by relying on iTunes sync. If you fear of any data erasing, you can turn to third-party iPhone transfer tool such as MacX MediaTrans to do the transferring. Pros: Create any songs of your music library. 1. No quite intuitive interface - it takes a bit to figure out how to get ringtones onto iPhone. 2. No option to choose a fade-in/fade-out. There are two methods to custom ringtones for iPhone within the best ringtone application for iOS: you can either download tones or create your own. There are as many as 500000 tones available in the best iPhone ringtone app, covering comedy, hip hop, pets & animal, and so on. 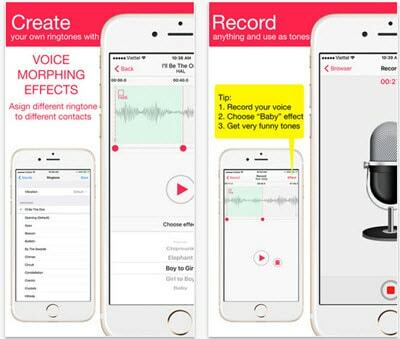 When it comes to ringtone creation, you must rely on the voice morphing effects. The free version contains ads but you can pay for $0.99 to remove them. Pros: A large number of ringtones. 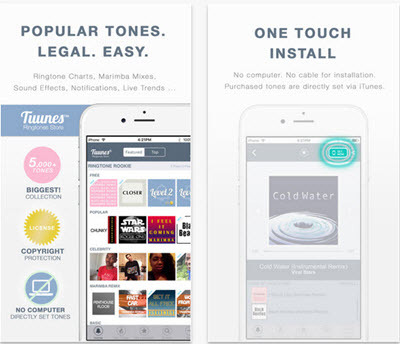 Cons: No choice to create rigntones from the iPhone music library in the new version. This is a free ringtone downloader and creator for iOS devices that allows you to browse through thunsands of ringtones, download mp3 music and turn it into a ringtone with custom start and stop times, fade in and out, and even record the song with the microphone built-in iPhone. Apart from iPhone ringtone making, it's available for you to browse, create and make unlimited text and alert tones. It offers many categories including Funny Sounds, Top, Christmas Tones, Classical, OST, Effects, etc. The best part is the iPhone app makes it pretty easy and straightforward to get the ringtone back into iPhone. Pros: Functionally complete and Fully support iPhone 7/Plus. Cons: It's full of ads. MacX MediaTrans is more than an iPhone ringtone app, but also a great music transfer tool. With an intuitive interface, you can get the hang of it and create custom ringtones in one click. You can actually move any song behind the clip which allows you to start and stop where ever you choose, in a 40-second loop. Besides, it features auto conversion, letting you to convert any audio formats (WAV, AC3, AIFF, OGG, WMA, etc) to MP3/AAC as iPhone ringtone format. 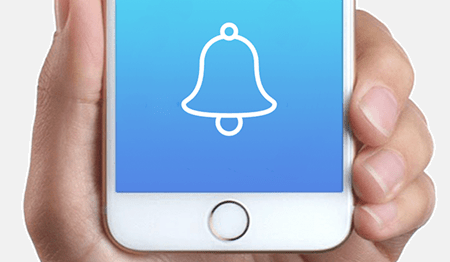 On the best part, this ringtone app is best for you to transfer any ringtone to iPhone 8/XS/XR/X to set as the default coming call ring without the need of using iTunes anymore. 1. Simple to use and neat. 3. It is on the iOS compatibility list in iOS 11 beta. MacX Free Music Downloader is another must-have tool iPhone users will never miss. It is both a free music downloader and an online video capture program. 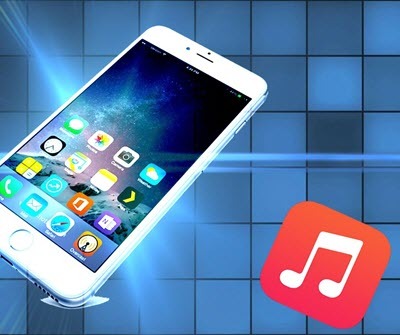 Within a simple clicks, you can download unlimited piece of music from YouTube, Vevo, Soundcloud, Grooveshark, Pandora, and more and then sync it to iPhone with iTunes to be used as iPhone ringtone. Plus, 4k videos, HD 1080p movies, TV shows, and other video clips are also downloadable from many famous online sites, covering YouTube, Vimeo, Dailymotion, and 300+ sites. 2. 100% clean, no ads. Cons: No option to sync music to iPhone. After all the best free ringtone applications or software for iPhone are listed, you may for sure long for a guide about how to make iPhone ringtones and add them to your iDevice. Just follow the step-by-step guide below to create exclusive ringtone for iPhone using one of the best iPhone ringone app - MacX MediaTrans. Step 1: Free download the iPhone ringone maker on Mac or Windows. Connect your iPhone to computer using a USB cable. Note: Please follow the instruction to adjust iTunes settings in order to avoid data erasing by iTUnes. Step 2: Click Music Manager, after which all songs are listed on the right side, select the music you want to set it as ringtone and then tap the Ringtone button to make ringtone. Step 3: Move the lines below to trim the music ringtone within 40 seconds. And click OK. Step 4: Go back to the main interface and click Voice & Ringtone to choose the ringtone you've just made. Click Sync to begin adding ringtones to iPhone 8/7/7 Plus/6S/6/5, etc with the ringtone app for iPhone. MacX MediaTrans is one of the best ringtone applications for iPhone that can easily make any songs (WAV, AC3, FLAA, etc) into exclusive iPhone ringtone in MP3 and AAC and add ringtones to iPhone without iTunes. Also support transferring music from iPhone to computer.